I made this pie for the first time last year when my best friend Kate requested it–she’d never tried it before and she was curious. And I wasn’t sure where to begin. The recipes I looked at seemed to mostly agree on the use of three eggs and one cup of corn syrup, but the proportions and ingredients differed from there. One involved orange zest. Other recipes called for white sugar as well as brown sugar. A few involved alcohol in the form of rum or bourbon. all brown sugar: I wanted the added flavor that brown sugar provides (it’s probably not much more flavorful than light brown sugar, but I like to assume that darker means more flavorful). 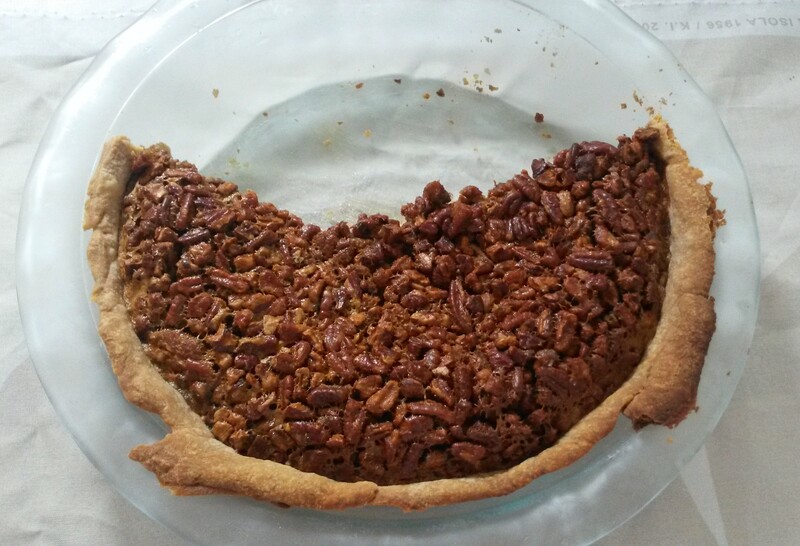 less sugar than usual: I often reduce the amount of sugar in recipes, and I was pleased to see that the writer of this recipe mentioned halving the sugar because standard pecan pies are too sweet for her tastes. As she says, there’s already a cup of corn syrup, so it’s a safe bet the pie is going to be sweet. molasses: Molasses has such a rich, deep flavor, and I’m instantly biased toward recipes that use it. This recipe requires only a tablespoon, and if you don’t have molasses in your pantry you can just omit it, but it’s well worth using if you have it on hand. I made a couple of slight changes. I used dark corn syrup instead of light (my brown sugar philosophy applies to corn syrup as well) and increased the amount of vanilla. I also sprinkled sea salt on top because I love the sweet/salty/nutty flavor profile. And, inspired by the recipes that incorporated alcohol, I added a splash of bourbon. While it baked I kept running back to the kitchen to check on the pie, nervous that I might burn it through negligence. And I did ultimately end up spilling some of the filling onto the oven floor in an attempt to put foil on the edges of the crust, giving the kitchen a lovely burning aroma while the pie finished baking (I cannot stress enough how glad I am about buying a silicone pie shield). But none of that seemed to matter: the pie turned out beautifully. 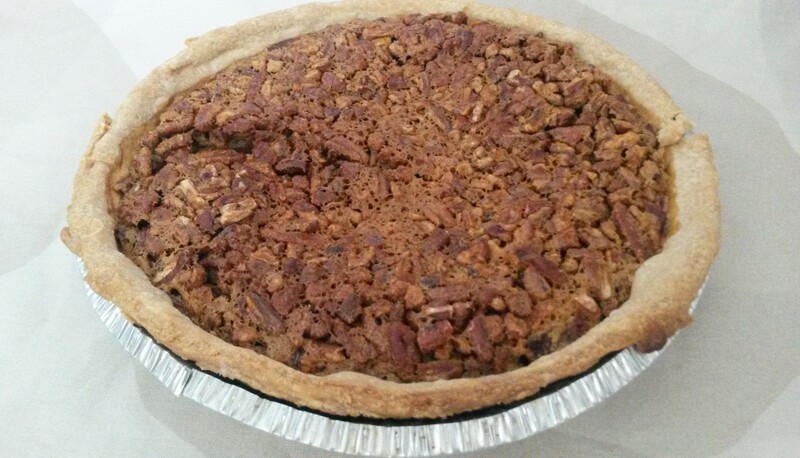 It had a crisp, nutty top where the pecans and the sugar had caramelized themselves into delicious merriment. Underneath that was a silky golden brown interior that carried the vanilla, molasses, and brown sugar flavors. I thought the pie was delicious, but that it didn’t compare to my favorite blackberry pie. 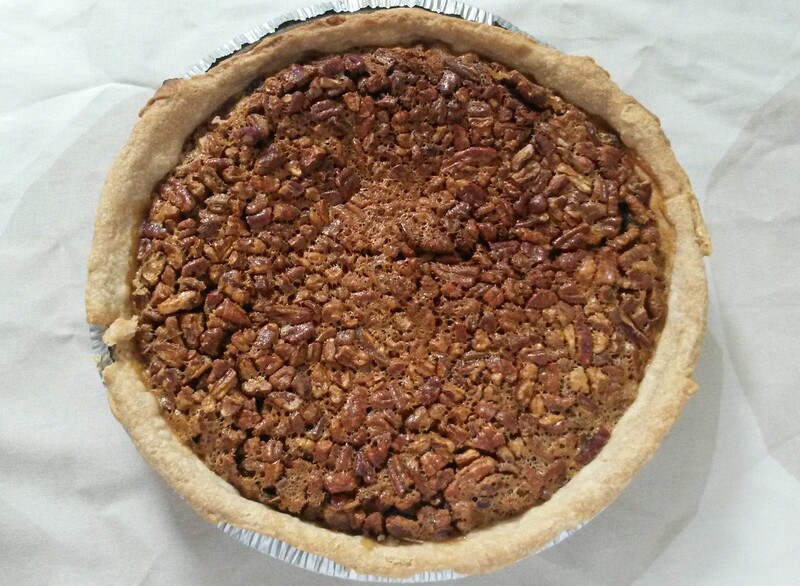 But when Kate tried it, she declared that pecan pie was now her favorite pie. I’ve made it twice more since then, both times for her. You’ll notice there are two pies in these pictures–one for us to enjoy while she visited me, and another for her to take on the plane ride home. Each time I made this pie, I played around with the ingredients. One time I used light corn syrup; another I omitted the bourbon and forgot to sprinkle the sea salt on top. And each time it didn’t really matter–this pie is delicious no matter what. Preheat the oven to 350 degrees. 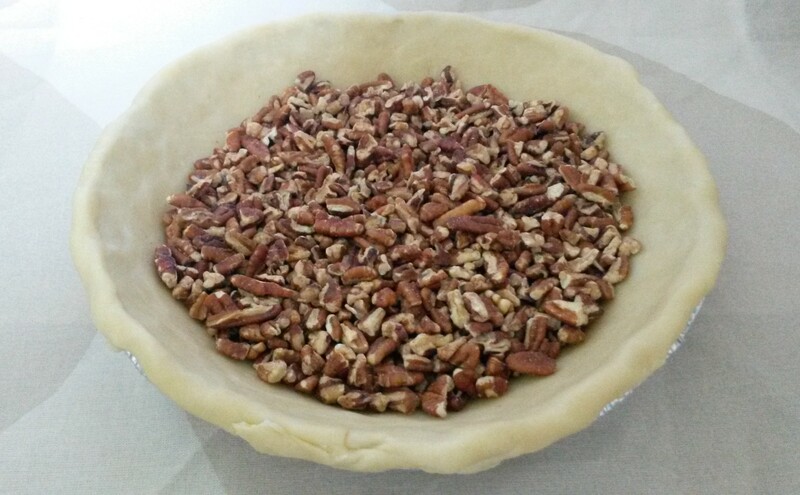 Put the chopped pecans into the pie shell and spread them evenly. They will rise to the surface after you add the filling. Then prepare the filling. In a large bowl mix together the eggs, brown sugar, corn syrup, molasses, vanilla, bourbon, and salt. Slowly pour in the melted butter and mix until combined. Pour the filling over the pecans. Sprinkle a pinch of kosher or sea salt on top. Bake for 30 minutes. After 30 minutes, cover the edges of the pie crust with foil (or a pie shield) to prevent browning. Bake for another 40-50 minutes until the filling has set but is still slightly jiggly in the center. (If uncertain, err on the side of set. My first time making this, I took it out too soon and it tasted slightly eggy; I ended up having to put it back in the oven to bake for longer.) Remove from the oven and let cool (and deflate–the pie will be puffed at first) before serving. I recommend serving it with a scoop of vanilla ice cream.